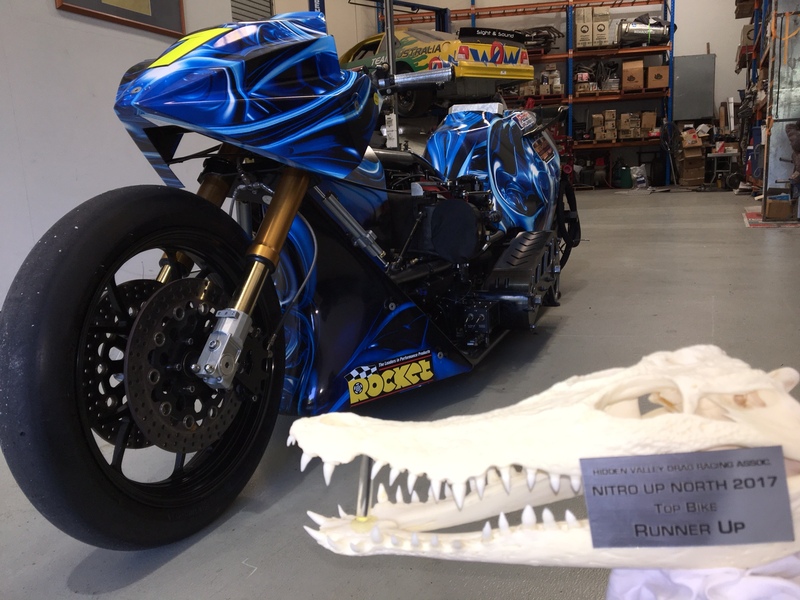 Multiple Australian Top Fuel Motorcycle Champion, Chris Matheson has taken home a much sort after Crocodile Skull Trophy and a Thunder 400 Christmas Tree, after the Nitro Voodoo Team efforts at Darwin’s Hidden Valley “Nitro Up North” meeting last weekend in Australia’s Northern Territory. Matheson Top Qualified with a blistering 6.26 second pass in hot conditions, which earnt him a new Track Record, more than a tenth quicker than the previous record, which stood for almost eight years. Matheson said “we had a race of two days, qualifying was strong with a 6.4, then a 6.26, which was half a second quicker than the next closest competitor in a strong eight bike field”. We were confident for the next day’s eliminations, only to have rear tyre issues and smoking the tyre in all three races. The Bike is showing good signs of progress, reliability and it’s sounding very strong. My Team really worked hard in the heat all weekend and it paid off, with a bag of points, along with a Track Record. We now hold the ET Record of five of the six Group One Tracks across Australia, along with the National Record of 6.048sec at 241.8mph (389kph). Perth Motorplex is the last on our list, which we hope to visit later this season. 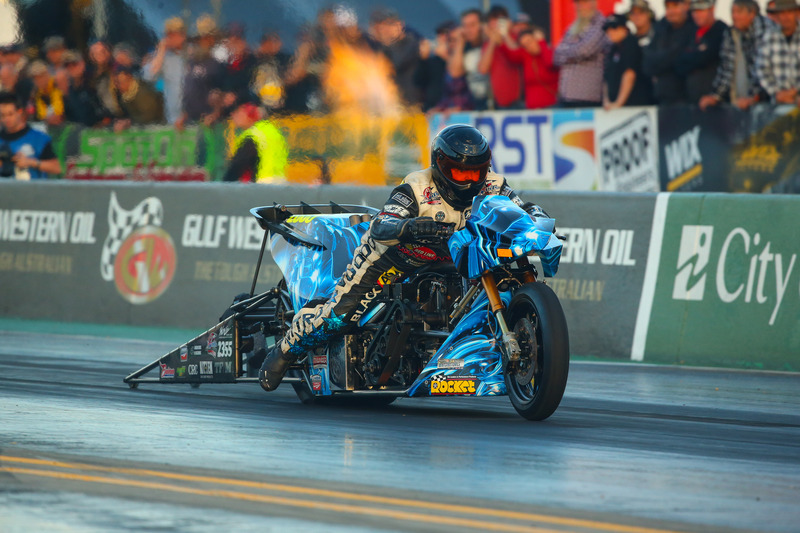 The “Nitro Up North” event was a great success, big crowds and plenty of great racing. ANDRA, Thunder 400, Northern Territory Government, Darwin’s Hidden Valley Drag Strip all put on a great meeting and we look forward to returning soon. GT Radiators & Machining, Kitten Car Care Products, CRC, Rocket Industries, Performance Wholesale, Great Southern Diesel Service, WebCam, PDS Graphics, Worldwide Bearings, Hi-Side Leathers, Boninfante Friction Inc., Ballistic Racing, Aeroflow, with special thanks to Steve and Larry McBride.